October 1 marks the beginning of “National Sudden Cardiac Arrest Awareness Month”. The event was designated by Congress in 2008 due to the more than 326,000 out-of-hospital cardiac arrests that occur in the United States each year. 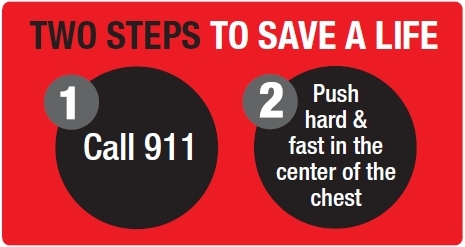 The month-long event seeks to raise awareness about Sudden Cardiac Arrest (SCA), its warning signs and how to respond, in an attempt to decrease deaths resulting from cardiac arrest. Immediate CPR triples the chances of surviving sudden cardiac arrest, yet only 32% of SCA victims receive CPR from a bystander. Many people assume that if they are not medically-trained, they are not allowed or unable to perform CPR. Unfortunately most individuals feel helpless in an emergency situation for a variety of reasons. All 50 states have “Good Samaritan Laws” in place that were created for the purpose of protecting people who in good faith, voluntarily give reasonable aid such as CPR or use an AED in an emergency situation where EMT rescuers are not yet available on the scene. These laws were designed to reduce this reluctance of persons to render aid for fear of being held liable in a civil suit. As long as the rescuer is not willfully negligent or reckless in giving aid, and gives aid in a reasonable manner, then the rescuer will not be held legally liable for the outcome. Hands-Only CPR™ is intended for anyone who witnesses a teen or adult suddenly collapse. Without CPR, brain damage occurs within minutes of the brain being deprived of oxygen and after 10 minutes without CPR or a shock from a defibrillator, there is very little chance of survival. Following a collapse, there is enough oxygen in the blood to pump through the body and give vital oxygen to the brain if CPR is performed immediately. Do not be afraid to step in and perform Hands-Only CPR™, your actions can only increase their chances of surviving.